Those of you who follow me over on Instagram saw that after Christmas I made a breakfast hash from the leftover honey ham that I baked for Friendsmas. Quite a few of you asked for the recipe. Guess what? I didn’t have one. I just threw what I had in the house together in a skillet and baked it. It was Christmas morning, and I was ill prepared to feed my family breakfast. Guys this was out of pure necessity and not planned beforehand. And it turned out pretty good! Unfortunately, I don’t have any measured out ingredients for this one, but I can give you the step by step. Make with love and season to taste! 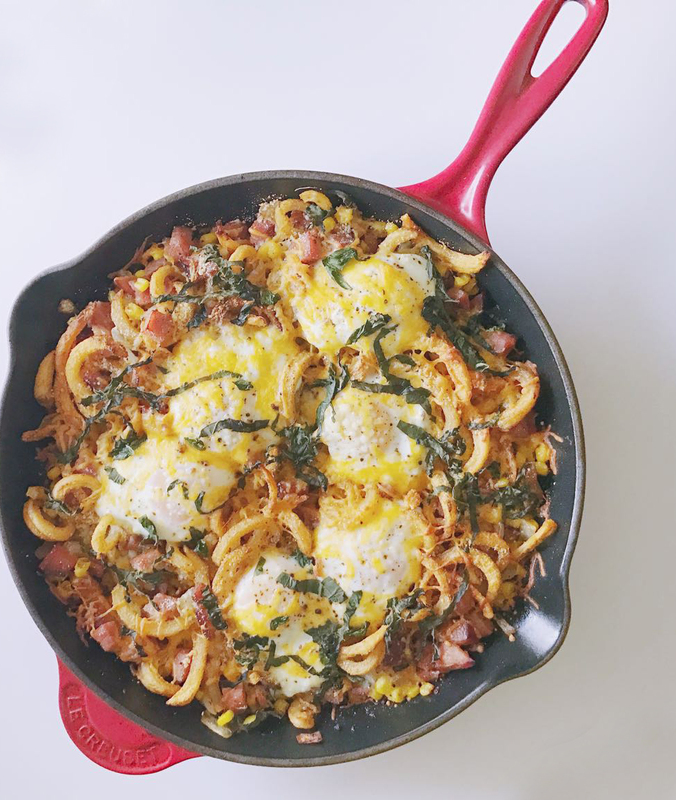 Leftover breakfast hash could literally be made with ANYTHING. Do you have leftover taco meat? Instead of the ham, substitute with the ground beef. Use Mexican cheeses instead of the parmesan and cheddar, add tomatoes, sprinkle a little cilantro and make it a south of the border style dish. Yummy breakfast made from leftovers and random ingredients in the house after Christmas! In a cast iron skillet, or any other oven safe skillet big enough to hold all the ingredients, heat 1 tablespoon of olive oil over medium-high heat. Once hot, saute onions until clear. Season lightly with salt, both peppers. Add cubed ham. Stir together until well mixed and warm. Stir in corn. Season again to your taste. Mix in cooked potatoes (fries, tater tots, etc). Once well mixed, turn off heat and crack the eggs over the skillet. Sprinkle parmesan and additional salt and pepper over eggs. Cover with cheddar and fresh basil ribbons. Place in the oven and bake until eggs are cooked the way you like it! Over medium is my favorite. 10-15 minutes.